The FourierExtrapolationMAFree indicator transforms and extrapolates the Moving Average function by the Fast Fourier Transformation method. 1. The transformation period is set by two vertical lines, by default the first blue line and the second pink. 2. By default, the Moving Average (MA) line is drawn in red. 3. By Fourier Transform, the indicator builds a model of N harmonics, which is as close as possible to the MA values. The model is drawn by default in blue over the MA for the period between the two vertical lines set by the user. 4. For the period after the second vertical line, the indicator draws a line Fourier Extrapolation model - predicts the probable movement of the Moving Average line. The line predicts the default movement of pink. 5. The trend green line, which begins with the left vertical blue line, is the axis along which the harmonics are calculated, transformed and extrapolated. The initial and extreme prices of the Axis are equal to the initial and extreme values ​​of green MA. Green MA is drawn only between the blue and pink vertical line. The goal is to find the slope of the market. Harmonics Amount - the number of harmonics with which the Fourier Transformation model is built. Length - the distance between two vertical lines, the period for which the Fourier Transform model is built. AllowComment - if true, the indicator writes the actual parameters of the indicator in the upper left corner of the chart. The user can change the parameters of the indicator after initialization through the keyboard keys. This allows you to configure the indicator without re-initialization. When you press different keys, different parameters change in real time. K - when pressed, moves the beginning of the Trend line. Axis up by 10 pips. L - when pressed, moves the beginning of the Trend line. Axis down by 10 pips. 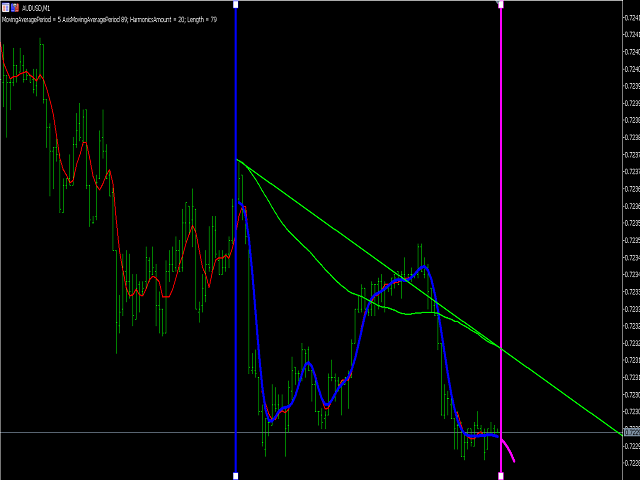 ; - when pressed, moves the end of the Trend line Axis up by 10 pips. 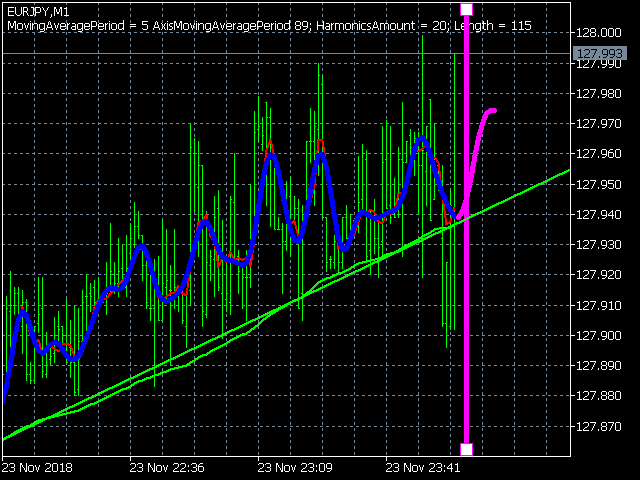 - when pressed, moves the end of the Trend line Axis down by 10 pips.